This piece is a duet for violin and cello and was composed in 2003. The nostalgia felt as the music begins symbolizes the absence of one's love. As the piece progresses, this nostalgia dissipates, leaving room for joy (reunion). 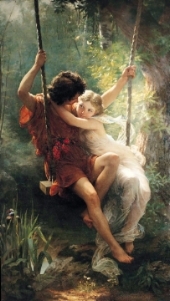 This duet spans a wide range of emotional expression, along the same lines as the piece Romance for the Harp.